We were on scene at the National High School Cheerleading Championship in Orlando, Florida on February 10-11 to watch over 700 of the top high school JV and Varsity teams duke it out for the coveted white satin National Champion jackets! The Varsity Coed divisions took the floor to compete in finals on Saturday evening, where Kentucky teams dominated the mat. In the Large Varsity Coed division, Graves County came back from their second-place finish in 2017 to win their seventh national title. 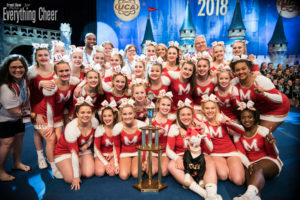 In Medium Varsity Coed another Kentucky team, McCracken County High School, earned a second consecutive national title, their third in total. The all-girl Varsity divisions faced big numbers and fierce competition as they competed in three different rounds throughout the weekend. With prelims and semi-finals taking place on Saturday, the HP Field House was packed for the division finals all day on Sunday. The Large Varsity divisions took the floor first, alternating between DI and DII. In Large Varsity DII, Bishop McCort took home the gold for the first time since 2015, marking their third Nationals win. 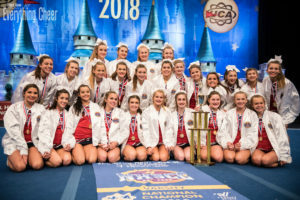 In DI, Fishers High School beat out several storied programs to win their program’s first-ever national title, after a seventh place finish at last year’s competition! The morning sessions wrapped up with the Super Varsity divisions, where in DI Houston High School earned a second consecutive national championship, bringing their total count up to six. In Super Varsity DII, St. Joseph’s Academy took home their first national title ever, with Boaz High School and Liberty Christian High School taking second and third in the division. After the lunch break, the Medium Varsity teams took the floor in two of the most competitive divisions of the weekend. In Medium Varsity DI, Live Oak High School was determined to take back that national champion spot after a second place finish at last year’s competition. In 2016, Live Oak took home first place titles in Medium Varsity DI and in Super Varsity Game Day, so this year they made it their mission to reclaim the gold! In Medium Varsity DII, Corbin High School came back from a disappointing prelims performance to win the entire division, capturing their second national title in three years. The largest Varsity divisions, Small Varsity DI and DII, wrapped up the weekend’s events, with finals taking place on Sunday night in the HP Field House. With over 115 teams in the division, even just making it to finals was a tough challenge. Small Varsity DI turned out to be a real shocker, with Corner Canyon High School taking first place. Corner Canyon is a relative newbie to the National High School Cheerleading Championship, coming for only the past 4 years and never placing higher than 17th. But this year a nearly flawless finals routine filled with difficulty and clean technique was enough to beat out all the other competitors in one of the toughest divisions of the weekend. 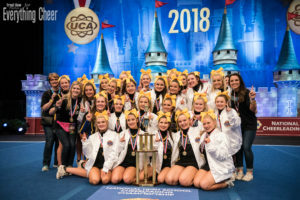 In Small Varsity DII, Pikeville High School was able to successfully defend their National Champion title, despite having only 2 seniors on the team. With such a strong and young team, we are expecting them to put up a fierce fight for a three-peat at next year’s competition! Congratulations to all of this year’s medalists, as well as all the teams who competed this weekend! View a list of medalists below, and a complete list of results here!